MEXICO CITY - In the 10 years since he escaped from a high security federal prison in a laundry truck, Joaquin "El Chapo" Guzman has transformed himself from a middling Mexican capo into arguably the most powerful drug trafficker in the world. The boyish-looking kingpin, who made his storied prison break on Jan. 19, 2001, has seized ever greater control of Mexican territory in bloody battles with rivals. His fortune has grown to more than $1 billion, according to Forbe's magazine, which listed him among the "World's Most Powerful People" and ranked him above the presidents of France and Venezuela. His tentacles now extend from Argentina to Australia. He has done all this with a $7 million bounty on his head and while evading thousands of law enforcement agents from the U.S. and other countries devoted to his capture and the destruction of his Sinaloa cartel. "We have personnel dedicated strictly to Chapo Guzman. That's the importance we have placed on getting him," said a top DEA official in Mexico who cannot be identified for security reasons. "If you totaled up U.S law enforcement and foreign law enforcement stretching through Central America, South America, certainly thousands of law enforcement personnel are exclusively focused on the entire Sinaloa operation." Guzman, 53, keeps authorities running with the support of many locals in his home in northwestern Sinaloa state, where he reportedly uses his wealth to help the poor and his drug-trafficking business to keep many employed. He is thought to be hiding out in the mountains of the "Golden Triangle" straddling Sinaloa and Durango states - territory so remote and lawless that housewives grow opium poppies for decoration and it can take police hours to reach the scene of shootings. One U.S. diplomatic cable released by Wikileaks quoted Mexican Defense Gen. Guillermo Galvan Galvan as saying that Guzman moves between 10 to 15 locations to avoid arrest and has a security detail of up to 300 men. "With Chapo, he's got the whole Robin Hood thing going," the DEA official told The Associated Press. "People in close proximity to him might not be motivated to turn him in." Guzman's escape from a prison in Guadalajara was a major embarrassment for then-Mexican President Vicente Fox, triggering persistent allegations that the Sinaloa cartel is protected by Fox's National Action Party, or PAN. Those rumors haunt President Felipe Calderon, Fox's successor also of the PAN. "It's an obvious stain on the PAN governments," said Manuel Clouthier, a PAN federal congressman who angered his party last year by accusing the government of failing to seriously pursue El Chapo's cartel, or the local politicians and police who protect it in Sinaloa state. "In Sinaloa, I have no doubt that organized crime rules," said Clouthier, who represents Sinaloa. "There are whole neighborhoods controlled by criminals. Every day, there are more luxury homes built where we know they live without fear." Calderon, who has intensified the fight against drug cartels more than any other previous Mexican leader, vehemently denies favoring the Sinaloa gang, also known as the Pacific cartel. "The Pacific criminal organization is being hit in its leadership in a very systematic way," government security spokesman Alejandro Poire said at a recent news conference, ticking off the names of Sinaloa traffickers who have been killed or captured since Calderon deployed tens of thousands of troops four years ago to fight drug gangs in their strongholds. The biggest strike against Sinaloa was the death of Ignacio "Nacho" Coronel, the cartel's reputed No. 3 capo, who was killed in a July 2010 gunfight with soldiers in Guadalajara. But top government security officials have also been caught taking bribes from the Sinaloa cartel, fueling speculation that some in Mexican law enforcement want to let the gang thrive while destroying its rivals. Among them is former drug czar Noe Ramirez, arrested in 2008 for allegedly taking $450,000 from Sinaloa's then-ally, the Beltran Leyva cartel. Born poor in the small town of Badiraguato in Sinaloa state, Guzman started out with the Guadalajara cartel in the 1980s, then run by Mexican godfather Miguel Angel Felix Gallardo. After Felix Gallardo was arrested in 1989, the gang split, and Guzman took over Sinaloa's operations, controlling trafficking routes through Arizona and battling the Arellano Felix cartel for the border city of Tijuana. In 1993, gunmen linked to the Arrellano Felix gang attempted to assassinate Guzman at the Guadalajara airport, but instead killed Roman Catholic Cardinal Juan Jesus Posadas Ocampo, outraging Mexicans. Guzman was arrested within days in Guatemala. Eight years into a 20-year prison sentence, El Chapo slipped out of the Puente Grande federal prison in Guadalajara in a laundry truck. He allegedly was helped by the prison director and two dozen guards. It was after that the name "El Chapo" started to become legend, rivaling Colombia's Pablo Escobar, whose reign of terror spanned 10 years before he was killed by police in 1993. Guzman was the first to break a nonaggression pact reached by Mexico's top cartels several years ago to wrest smuggling routes through the northern state of Chihuahua from the Juarez cartel, according to one of his former allies, Edgar "La Barbie" Valdez. 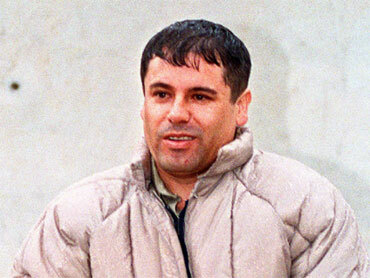 U.S. law-enforcement officials say Guzman has largely won that fight. Even some of the Mexican government's biggest victories in the drug war have seemed to benefit "El Chapo." The leader of the Arellano Felix gang was arrested in 2006 and its feuding remnants are too weak to put up a serious fight. Now, Guzman appears to be finally winning Tijuana, the coveted border city across from San Diego that had eluded his grasp for two decades. Mexican authorities say the seizure of 135 tons of marijuana in Tijuana in October - the largest-ever in Mexico - probably belonged to Guzman. "The virtual destruction of the Arellano Felix cartel has opened a vacuum, which is being exploited by the Sinaloa cartel and Chapo Guzman, who is arguably and probably provably the largest, most powerful organized crime head in Mexico," U.S. Customs and Border Protection Commissioner Alan Bersin told the AP. The government also has all but dismantled the Beltran Leyva gang, rivals of Guzman since breaking off from the Sinaloa cartel in 2008. There are signs Guzman is moving to take back Beltran Leyva strongholds, which stretch from the Pacific resort city of Acapulco to the southern outskirts of Mexico City. In Acapulco last week, the beheaded bodies of 14 men were found at a shopping center. Handwritten signs left with the bodies were signed by "El Chapo's People." Mexico's attempts to nab him have at times only fueled his mystique. He was rumored to have staged an elaborate public wedding in 2007 to an 18-year-old bride that was attended many officials and local police. Federal police say they raided the town that day, but got there just a few hours too late.